Maples heartwood is usually light reddish brown but sometimes considerably darker. The sapwood is commonly white with a slight reddish-brown tinge. This species has straight grain and contains fine and uniform texture. We stock this real wood veneer in a 20mil (twenty thousandths of an inch thick) backing to provide more stability than the more common 10mil. Maple veneers tend to dry out and crack more than other species. 10mil maple veneers are available upon request. The 20mil back provides more stability and it can still be bent, flexed and curved while maintaining properties that can’t be achieved with solid wood. 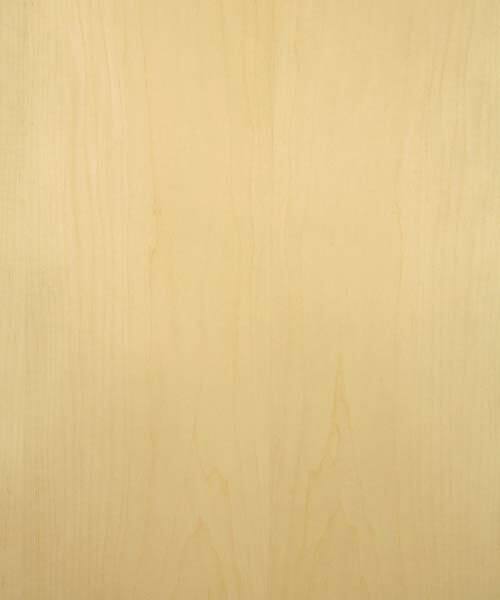 These maple veneers are plain sliced or flat sliced. Plain slicing is when the veneer is cut parallel to the center of the log. Hard Maple veneers are known to expand and shrink by up to seven percent. Shrinkage can occur based on humidity, temperature and moisture. This paperback veneer is not pre-glued. The best way to apply this veneer is with spray on adhesive. Please take care in handling your maple veneer as it can split and crack if mistreated. Read this great article on how to apply your veneer written by our friends over at GL Veneer. We can also provide curly, birdseye and quartersawn maple veneers. Sequence matching is available. additional charges may apply. For more information regarding sequence matching, custom sizing or backings please contact us for availability and pricing.